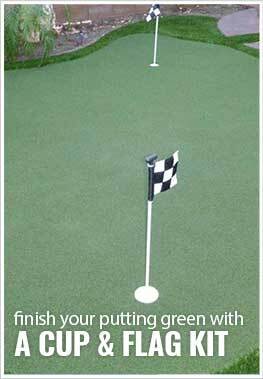 Description - Create the perfect putting green surface in your backyard or at your local golf course with our Pro Putt Turf Rolls. These artificial grass rolls have the look and feel of natural Bentgrass without the maintenance time or costs of natural Bentgrass. A 15-year warranty backs our Pro Putt Turf Rolls. Stimp Reading - Like all artificial, or real for that matter, the stimp reading will vary with installation. The range will be between 9 to 11. You can speed it up by adding more putting green infill and rolling with a water roller. Depending upon the desired speed, you may also want to slow down the surface by using a power broom to "open up the fibers". Face Weight – 44 oz. Weight – .47 Lbs. per square feet. Recommended Uses – Our Pro Putt Turf Rolls are perfect the perfect alternative for natural Bentgrass and are used as putting green surfaces in backyard putting greens, at golf courses, and much more. Putts and rolls true in all weather. Real Bentgrass look and feel.